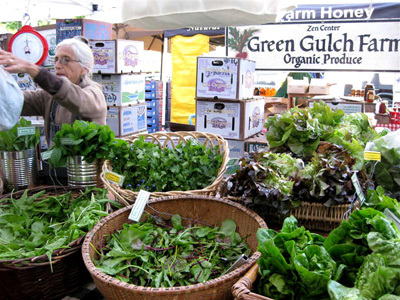 Green Gulch Farm will return to the Ferry Plaza Farmers’ Market on Memorial Day Weekend, Saturday, May 26, 2012. We will be in our usual place with our wonderful produce. We hope to see you there on Saturday and throughout the season until mid-October. Check out the CUESA website for more information about the market at www.cuesa.org. Location: On the street side, to the right of the clock tower when you are facing it, closest to the arcade. Produce is available at Green Gulch Farm on Sundays following the morning lecture, from 11:15 am to noon, April through November. Green Gulch Farm produce is also available at the Farmers’ Market at Blithedale Shopping Center in Mill Valley on Fridays, 9 am to 2 pm, June through October. The opening date for 2012 will be June 1.